Municipal authorities and landlords can be notified of bad or unsafe drinking water in a building or community. 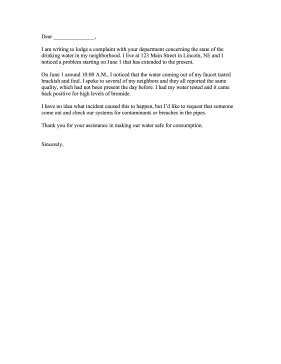 I am writing to lodge a complaint with your department concerning the state of the drinking water in my neighborhood. I live at 123 Main Street in Lincoln, NE and I noticed a problem starting on June 1 that has extended to the present. On June 1 around 10:00 A.M., I noticed that the water coming out of my faucet tasted brackish and foul. I spoke to several of my neighbors and they all reported the same quality, which had not been present the day before. I had my water tested and it came back positive for high levels of bromide. I have no idea what incident caused this to happen, but I'd like to request that someone come out and check our systems for contaminants or breaches in the pipes. Thank you for your assistance in making our water safe for consumption.